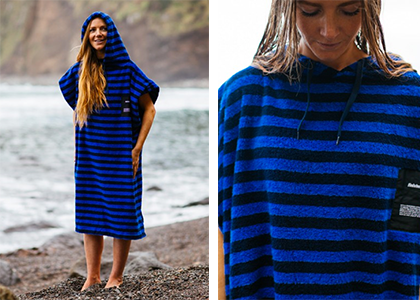 Whether it’s open water swimming, triathlon, surfing or any other sport where you need to get changed outdoors, a changing robe is brilliant addition to your kit bag. These changing robes may be reminiscent of your childhood beach holidays, but we LOVE them – no more wrestling with your towel whilst trying not to flash your bum! This soft terry looped changing towel is designed to get you warm and dry as quickly as possible. Its generous size allows plenty of space to get safely in and out of wetsuits and swimwear without revealing more than you’d like to passers by. We love the simplicity, versatility and the stripes are fab! 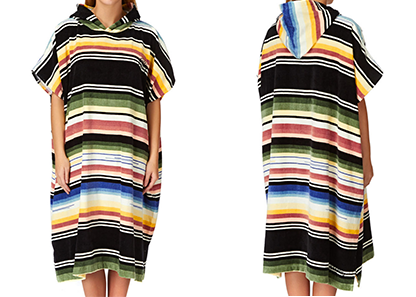 This is the changing robe for all-year and all-weather use. 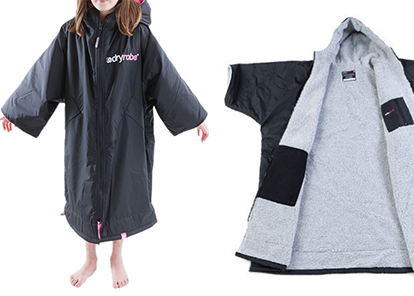 It features a myriad of pockets as well as being shower and wind proof. The design allows plenty of room to pull your arms in through the sleeves and get changed inside it and the soft lining dries really quickly so you can use it multiple times throughout the day. Serious kit for serious athletes! Designed for the beach, but will do the job by the lake or in a carpark too! 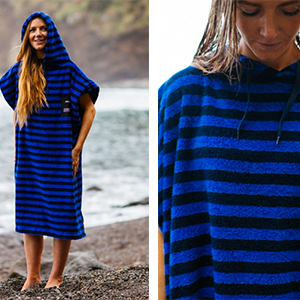 This super-cool ethnic stripe robe by Billabong is roomy enough to change wetsuit or kit and comes in a lovely soft cotton velour fabric. One for the fashionistas!